How do I change where photos and videos are stored on my Samsung Galaxy Tab?S 8.4? By default, your captured pictures and videos are stored on your device's internal memory. If you have installed a microSD™ card, your device will ask if you want to change the storage location to the microSD card the next time you open the Camera application. To change the default location, from the Home screen, touch Apps > Camera. 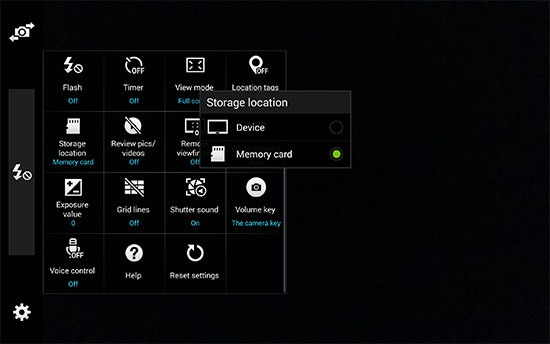 Touch in the bottom-left corner to access the Camera settings, and then scroll to and touch Storage location. Select Device or Memory card. Galaxy Tab S3: Where are my photos and videos stored and How can I move them? How Do I capture screenshots on my Samsung Galaxy Tab?S 10.5? Tab S3: How do I write or draw on a picture using my Samsung Galaxy Tab S3(SM-T820)?